SANTA BARBARA. Another day at work -- a few hours trimming the bougainvillya (sp?) -- which drapes down the hillside and sprawls over the fence. The problem is that this lovely shrub is infested with morning glory vines which are choking in profusion. It is necessary to trim the bougainviller quite a bit in order to get at the roots of the morning glory. Fortunately, the boogervillain loves a good whacking and will sprout abundantly after I am done with it...... Such is my plan for today. Charlie Berg lived on South Fourth Street in LaConner. He had a constant view of Mount Baker from his front yard. Ben Munsey Leaped Over the Fence -- with apologies to Ben Munsey who would just as soon forget this story. Fishtown Woods. I wrote 3,000 words on this topic in the last issue. Three people read the whole thing and they thought it was really great. I have quite a few more thousand words to go, but in the mean time I give you these little poems and vignettes for your amusement. Subscriptions for $25. Your subscription money keeps the editor from getting cranky. Your dollars keep him on an even keel. He needs to maintain a sense of detachment and keep his sense of humor. Help him out.... Just follow the instructions below. Subscriptions for $25 can be paid at PayPal on the Frog Hospital blog. Or you can mail a check for $25 to the address below. “Guilty! Guilty! And we will not rest until the last stump is cut. Sawdust and saw bones, every tree, gone to the saw mill. Be it cedar. Be it fir. Be it maple. All coming down. Alder, willow, all coming down. Thursday, January 21, 1988, from the Skagit Valley Herald, in a story written by John Draper. The photograph of Sande Howard and Willow Jorgenson was taken by Stephen Schroeder. MOUNT VERNON – Art Jorgenson wasn’t talking much this morning about his second night in jail this week. But his friends were, and they talked about how roughly sheriff’s deputies treated Jorgenson and other protestors at the second day of active demonstration at a Fishtown clear cut site near LaConner Wednesday. Six people were arrested near the clear cut Wednesday as a follow up to 11 arrests made at the site on Tuesday. For three of the protestors, it was the second arrest by Skagit County deputies in two days. Art Jorgenson, a resident of Fishtown, David Helm of Ferndale and Elizabeth Fries of Bellingham were arrested on charges of criminal trespassing and spent the night in the Skagit County Jail. The three were released on their personal recognizance this morning by Skagit County District Court Judge Larry Moller. The judge let them go only after they promised they wouldn’t go near the clear cut site, the access road and any other places that will be posted no trespassing…. Wednesday’s arrests bring to 14 the number of people taken to jail in connection with the protest of a 60-acre clear cut near Fishtown. “These are not scum they’re putting in jail,” said protester Paul Hansen, who was arrested Tuesday. He was among a small group of protesters holding signs in front of the jail this morning while their comrades were making a court appearance…. As the protestors stood in front of the jail, William Welch, owner of the logging company cutting the trees, walked by and smiled. He is serving on jury duty. The land is owned by the Chamberlain family. The owners decided to clear cut the land about ten years ago and waited until now for the timber market to improve. They were advised by forestry consultants that the only proper way to harvest the land was to clear cut it, and the state Department of Natural Resources issued the permit for the harvest after it determined it posed no potential for damaging public resources. But an appeal of the permit by LaConner resident Fred Owens states, among other things, that the permit wasn’t given proper review and that the clear cut endangers wildlife in the area. The appeal will be heard Monday by the Forest Practices Appeal Board at the Skagit County Courthouse, Jeff Bode, Seattle attorney for the protesters, said this morning. Bode said also said he will seek a suspension of the permit by the Forest Practices Hearings Board today. Well-known novelist Tom Robbins of LaConner was in front of the clear cut with others when the six were arrested Wednesday and he described rough treatment by the deputies. Robbins said he was standing next to Jorgenson at a small nearby bon fire when a deputy arrived and asked whose fire it was. Jorgenson said it was his and the deputy said he was under arrest, Robbins said. Jorgenson was grabbed, “slammed” into the trunk of the car and called a derogatory name, Robbins said. Along with criminal trespassing, Jorgenson was also arrested for reckless burning. Helm and Fries complained they were standing in the public right of way when they were arrested Wednesday. Ron Panzero, chief criminal deputy with the Skagit County Sheriff’s office, said the deputies were not rough with the protesters. Also, he noted that the people were arrested on the public right of way, that was after the deputies saw them on Chamberlain’s property. Fries complained she was treated roughly when arrested. She said three deputies grabbed one of her arms and dragged her across the road. Art Jorgenson could not abide the prospect of logging near his cabin in Fishtown. He gave me $600, which was all the money he had in the world. He told me to file a lawsuit against the Chamberlains, “Not One Tree,” he said. I filed the lawsuit pro se and then we hired Jeff Bode, an attorney who worked for us pro bono. I forget what we did with the $600. All this happened in 1988, a long time ago. Fishtown started quietly, as a haven and retreat, but it ended in almost violent conflict. Drama can be put off, but drama will have its day. My reward for writing the Fishtown Woods story is two-fold – people will get mad at me, and I won’t make any money…………… That’s pretty thin. I don't even claim to render a true account. In the process of correcting old errors I will likely introduce new errors. But I will try my best. As for being even-handed, balanced, objective and so forth -- I will try this but only to a limited extent. I was actively involved in the protest and in the legal appeal, which is why I have all the court documents. I will talk to William Welch the logger, if he wants to talk with me, and I will talk with the Chamberlains -- but basically, they can write their own versions if they don't like mine. They [the Chamberlains] helped me and some friends put food on our tables that winter by letting us cut firewood for free. I too have been roaming those words for over 50 years and was down there when the archaeologists were exhuming artifacts. I think the tribal members were probably more concerned with that than the logging. I always asked them for permission as I knew whose property it was. I also know that a lot of people moved in to that neck of the woods in the 60 ' s and 70 ' and took advantage of landowners like Cram, Lee, Chamberlain, Al's landing owner, Cliff Oredsen, and Staffansons. Frederick Winyard, A Computer Programmer from Anacortes, gives his reaction to the Fishtown Woods story. He says he made other choices. no awareness, no educated vocabulary. causes I liked until they got rich and didn’t need me. to do things: buy land, own it, set it aside to preserve. Think it is un-necessary to demonstrate valid standing. right things, just don't say the right things. Art Jorgenson fought the loggers and got arrested twice for his effort. Nearly Normal Jimmy lived in Fishtown -- just like Art -- but he didn't join the protest -- wanted nothing to do with it, just a lot of trouble for him and his wife Joan and his dog Zeke. A year later, when they tore down the Fishtown cabins and evicted everyone, Nearly Normal Jimmy got kicked out too....... I never talked with him about this, to ask him if he was hoping to play it safe, or just figured it was pointless to protest, but if that was his strategy it didn't work. Got hung for a traitor anyways. Keith’s Fishtown cabin was empty two years later when the Fishtown Wood Massacre began, and his old car was growing weeds in the parking area out by the old quarry on Dodge Valley Road. It was a Sprite, one of those little English sports cars, only Keith had removed the trunk cover and done some work with a hack saw to make room for a rotary gas-powered lawn mower. That way he could drive to his lawn-mowing appointments in town, to make enough money for Prince Albert in a can, and chunks of cheese, and bags of onions and coffee. Maybe some beer, but Keith didn’t drink much, he was crazy as a hoot, but not a drunk. Here is one of the leases, dated Dec. 16, 1986, in a letter from Christopher Shaefe in Arizona -- he was an in-law of the Chamberlain family. The letter is addressed to Sande Howard, wife to Art Jorgenson, mother to Willow Jorgenson. I have copy of the lease because it was submitted in the legal process that led to eviction. In the legal action, the Chamberlains could not prove title to the Fishtown cabins, but they could establish "superior possession" and the evidence for that were the leases, which the occupants had signed. Willow, Art and Sande were evicted in 1989 and the cabin was torn down. And also be it said that the Chamberlains owned the woods and owned the fields that gave walking access to Fishtown. There was never any formal permission or denial of passage across Chamberlain property, but I, speaking only for myself, feel like they probably don't want me on the premises. I have not been there ever again, except one time in 1999 when I was working on the U.S. Census to correct the maps for use in the Census of 2000. I had a legal right, as a census worker, to access the property and confirm that the cabins were no longer there. Which I did confirm. The cabins were gone and left no trace, only the willows of eternal spring, and the river that flows forever. Art Jorgenson started all this, putting up the money for the legal action – an appeal to the Forest Practices Hearing Board – an appeal to deny or foreclose on the permit to log off the woods. “Not one tree,” he said. Art died a few years ago, maybe ten years ago. He was going deaf and losing his sight, and I hardly ever saw him. After they tore down his cabin in Fishtown, he moved across the slough, to the head of Barge Island, and built another cabin. It was hardly a quarter mile from his old Fishtown place, just across the slough – really a side-channel of the North Fork of the Skagit River. Barge Island might be named on a map, it was a few tree-covered acres, but it was really only a sand bar that got bigger and decided to become permanent, and then inhabitable. Now there was a tiny passage, going down the inside of the island, a hidden waterway, not 15-feet wide, where you could pole a kayak from Art’s place, at the head of the island, to the downstream end, and there you might espy a drunken board landing leading to the modest hutch of Crazy Peter, who, unlike Keith Brown, was a drinking man, and you figured, if you saw him in town, that he might have been a glue-sniffer at one time, but had gotten over that, and now all he did was drink beer. He wasn’t that crazy, just drunk, and I might talk with him a little bit because he made no effort to engage me in his world vision – let people off easy for the most part, kept his ravings to himself. In a way, the Chamberlain family was punished for their generosity. The Chamberlains did not own Fishtown, but they did own the land that gave access to Fishtown and they did freely allow anyone to walk across their fields and to walk through that beautiful stretch of woods.... It would have been so simple to erect a No Trespassing sign, but they never did that. So, for many years, people wandered through the Fishtown Woods and came to love them, and when the Chamberlains decided to log off the woods, it stirred up a powerful reaction, so powerful that the protestors forgot to be grateful. 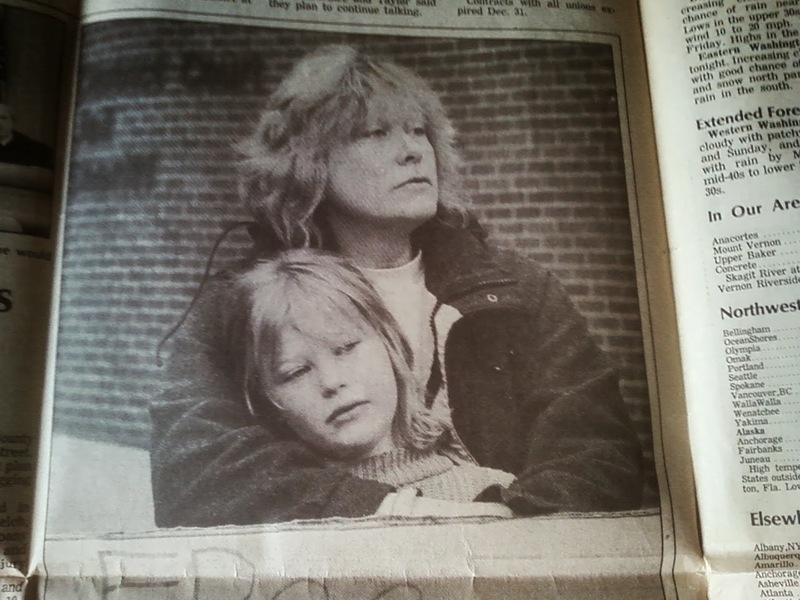 Willow Jorgenson, the daughter of Art Jorgenson, grew up in Fishtown. When the cabins were torn down in 1989, it was her home that was destroyed. She does not see the Chamberlains as being generous. Uhhhmmmm, grateful for what exactly? Thanks for the access to the river for a few years, so go ahead and wipe out the ecosystem and some ancient burial remains? I guess I still have a lot of passion. I remember them logging the last tree with a bald eagle's nest because the fine was less than the cost of the timber. I would try to protect that woods a thousand times over. And my Earth First! shirt from the protest proudly hangs in my closet 26 years later. As I remember it, most people were grateful to us for trying to protect the earth. Your comment painted us protestors with a wide brush. Just because they gave me river access does not mean they are entitled destroy a sensitive ecosystem and historic site. The court even decided later there was "glitch in the computer" and the area should have had further protections under the shoreline act. I wonder how the tribe felt about the destruction of their ancestral remains? Or should they have been "grateful" a few years went by before they were decimated? Sorry Fred, but there was a lot more to the story. Yes, there is a lot more to the story. Many people were involved and everyone has a different way of remembering it....... .....It's just not so black and white........... My intention is to tell this story -- and I have quite a bit more to tell -- because 26 years later, it still matters.... You lost your home in the process and suffered a much greater harm than others did. It was a spiteful action to tear down those cabins and it was wrong. I was writing about Art’s Coffee, before I interjected all these other stories. Art Jorgenson, sculptor, kayak builder, river dweller. He never came into town -- I never saw him not once come into town. Heron-friend and hermit. He had a cabin with a small cook stove, but he liked to build a fire on the ground outside and sit around it on a rock or a log – where I sometimes joined him. Art’s coffee. Boil water on the fire. Take a heavy coffee cup and pour Yuban coffee grounds right into the cup, about half-full. Then pour the boiling water on top of the grounds. Stir it up a bit with a stick, then let the grounds settle for a few minutes. Enjoy – very strong and very hot. Art was a beautiful man. Sam Cram had a farm outside of LaConner. If you met him at the post office it went like this. The dialog comes from a 25-page deposition in which the attorney for the defendants, aptly and truly named Ann Forest Burns, interrogated Bo Miller, president of the Great Blue Heron Society, representing the plaintiffs. Ms. Burns sought to determine if, in fact, the Great Blue Heron Society actually existed. "Mr. Miller," quoth Ms. Burns, "did you bring the articles of incorporation as stated in the subpoena?" “I did not,” said Miller. "Did you bring the list of membership and subsequent bylaws and the minutes of previous meetings?" "Then who, would you say, belongs to the Great Blue Heron Society and when and where do you meet?" asked Ms. Burns. "And what are the proceedings?" asked Ms. Burns. "And I remind you that you are under oath." “The proceedings, I suppose, are the care and protection of the Fishtown Woods,” said Miller. "You and each of you will please take notice that William R. Welch hereby enters his appearance...."
That being William R. Welch of Welch Logging of Anacortes, being the logger himself who did remove all the trees in the Fishtown Woods, with his crew helping, of course, and despite the dedicated opposition of various parties who wished the Fishtown Woods to continue as they were, or at least not massively altered. And Welch did appear, not smugly nor triumphantly, but as a humble petitioner before the court, and being no better and no worse than any other man in the state of Washington. “This is how I make a living, and my work speaks for itself,” he said. A letter to the Seattle Times, dated January 28, 1988, after Gilkey was arrested at the Fishtown Woods protest. I am obliged to respond to implications in some local press coverage of the Fishtown clear-cut-logging issue. I take exception to references to those in dissent as ex-hippies, indigents who pay no taxes, and radicals who put spikes in trees. Because my name was reported on television and in newspapers, with reluctance I make the following statement in contradiction. As a fourth-generation Skagit Valley resident, a World War II Marine Corps veteran who served in the 3rd Marine Raider Battalion in the invasion of Bouganville, Solomon Islands, I have painted landscapes in the area since 1946. I was awarded a Guggenheim Fellowship in painting for travel and study abroad in 1958. My work is in museums and public and private institutions, and has been shown in Europe and Japan. I own my own home, studio and truck free and clear. As a matter of conscience and social responsibility, and as an individual concerned with aesthetic and environmental integrity, I stood in the path of logging trucks and was arrested for criminal protesting. I was pleased to be standing with fellow artists, mothers and fathers, architects, a carpenter, writers, and university graduates, among others. My position was that the logging operation should be halted until the outcome of the court hearing is known. Margaret Lee lived her whole on a farm next to Fishtown. She thought Fishtown was a special place and here she tells why it was so special. Her testimony was submitted before the court in writing. I am of legal age, reside at 1180 E. Landing Road, Skagit County, Washington, and make this affidavit upon my own free will and voluntary act. Sometime around 1890, a partial dike was constructed along the Skagit River in front of Fishtown Bay which lies just west of Gage’s Point (named for my grandfather). A granary was built on the dike and a road was built in the valley that extends northward from Fishtown Bay connecting the granary to Dodge Valley. At and before this time, Indians lived and used this area. Several Indian trails that predate the granary are still present and were used by my sister and I when we were young to go to school and to walk through the woods. Art Jorgensen could not abide the prospect of logging near his cabin in Fishtown. He gave me $600, which was all the money he had in the world. He told me to file a lawsuit against the Chamberlains, “Not One Tree,” he said.